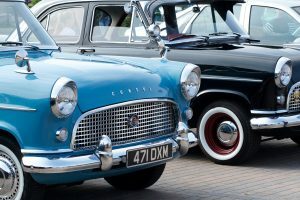 Long days, warm weather and glorious sunshine, summer is by far the best time to get out and about visiting one of the many car shows going on around the UK. Whether you’re looking to entertain your kids in the long holidays, want something to do locally or fancy a long weekend away, there’s a car show to suit you. We’ve picked our favourites. Bigger and better than ever, CarFest has become a standard of the summer car show calendar since Chris Evans launched it in 2012. The family car festival takes place at the end of July in the north and over the August bank holiday weekend in the south. ‘Body Types’ is the theme for 2018, so expect to see some wild and funky classic and modern cars from around the world in the paddock. There are dream rides available in exclusive cars (with money raised going to Children in Need), live music from Billy Ocean, Bananarama and Status Quo, a Vintage Village market and loads more family fun. If you’re unlucky and miss out on the remaining tickets then you might want to put it on your list for next year instead. FittedUK is one of the largest indoor automotive events in the country, featuring over 600 performance, modified and classic cars on display. It may be inside, but given the traditional British summer, it does offer a great excuse to dodge any potential showers. Boy racers and those who like their cars fast, loud and in top condition will love it. There’s a low rider display, RC drifting, live music, club and trade stands and hundreds of Europe’s finest show cars to marvel at. Europe’s largest gathering of BMW vehicles happens in August at the British Motor Museum. Organised by the BMW Car Club UK, the National BMW Festival is a vast showcase of new and old cars from across the iconic manufacturer’s range, including MINI, Alpina and AC Schnitzer. The German themed event lets you see the latest BMWs up close, buy accessories for your own car at the trade stands and even dance along to the Oompah band. In the mood for fast cars on the south coast? The Brighton Speed Trials in early September will be right up your street. More than 200 cars of all types and ages will be competing in timed sprints, including a Ferrari F40 and Lamborghini Countach. Plus, there’ll be a range of supercars on display such as an Aston Martin Volante, Porsche 911 Turbo S and more. Step back in time at the Goodwood Revival, the classic car show that fully immerses itself in an historic period. This year it’s the post-war era covering 1948 to 1966. Join in the fun by dressing up in 1950s or 60s gear to enjoy some classic car racing featuring vehicles from the era. This year celebrates Goodwood Revival’s 20th anniversary and along with the racing and fashion there’ll be a Spirit of Aviation display, fairground, and dancing on the lawn. If attending a 2018 summer car show reignites your love of vehicles, then check out our huge selection of used cars for sale.